Howlite is naturally white with the occasional gray patch and black spider-web markings. Howlite gets its name from the gentleman that discovered it – Henry How. The 19th century geologist originally located the stone in Nova Scotia. Also incorrectly referred to as White Turquoise, American Turquoise or White Jasper. 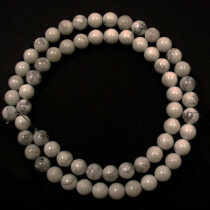 A-Grade Howlite stone Round 4mm (~100pce Strand) - 40 cm /16'" Strand. 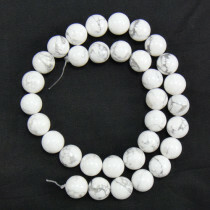 A-Grade Howlite stone Round 6mm (66pce Strand) - 40 cm /16'" Strand. 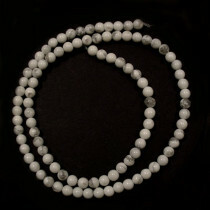 A-Grade Howlite stone Round 8mm (~50pce Strand) - 40 cm /16'" Strand. 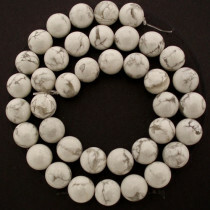 A-Grade Howlite stone Round 10mm (42pce Strand) - 40 cm /16'" Strand. 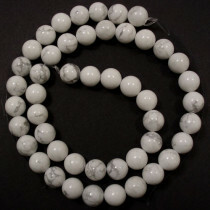 A-Grade Howlite stone Round 12mm (~33pce Strand) - 40cm/16'" Strand. 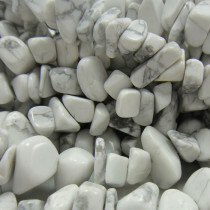 Howlite Large Stone Chips 8x12mm (~150pce Strand) - 91cm /36'" Strand.